Amazon’s HQ2 search is finally over. On the off chance that you have been on vacation and without internet access for the past week, Amazon chose neighborhoods in the New York City and Washington, D.C. areas for “dual” HQ2s (which I’ve started referring to as HQ2a and HQ2b). However, one Heartland city didn‘t walk away empty-handed. Amazon said it would add an operations center in Nashville, where it expects to employ 5,000 people with an average annual wage of $150,0000. 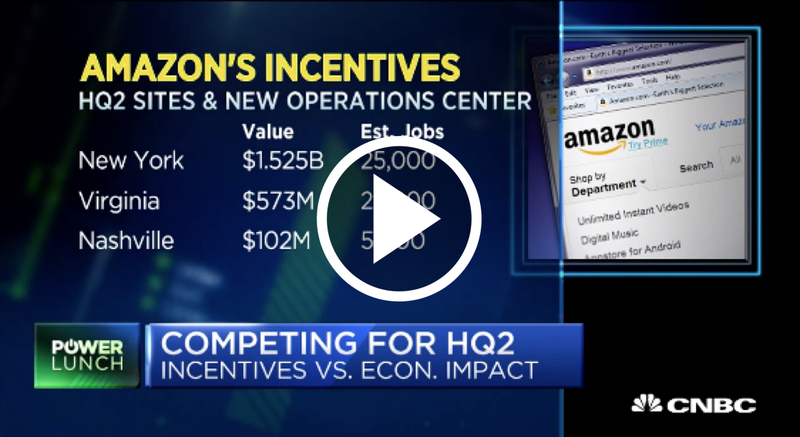 So will Amazon’s Nashville operations center be a throwaway consolation prize or a substantial investment? I think 5,000 jobs is a significant investment for Nashville — The Tennessean says it’s the largest single jobs announcement in Tennessee history. And the ratio of new jobs to current residents looks good compared to what New York and D.C. snagged. The Nashville metro area population is a sixth the size of D.C. and a twentieth the size of New York City, yet it will get a fifth of the jobs. It’s also good news that the Nashville jobs are projected to have the same average annual wage as the jobs that New York City and D.C. are expected to get. What is worrisome is that, when you break down the incentive package, Nashville is only paying roughly $2,000 less per job than D.C., for a fifth of the roles. Still, I think that the Amazon news combined with other expansion announcements — Crunchbase reported earlier this year that Nashville is one of the most popular cities for unicorn startups to set up secondary offices in — will prove important in making the city a more popular destination for tech workers. If you’re located in any of the finalist cities that Amazon didn’t choose — are you feeling relieved or disappointed? Send me your thoughts and feedback via email. You can also sign up here for VentureBeat’s Heartland Tech newsletter to get this column in your inbox weekly. The end of Amazon’s search for its new second headquarters makes it look bleak for cities to be able to land corporate investment without subsidies. Amazon spent more than a year looking for a home for its second headquarters — only to instead open two large satellite offices. SAP’s $8 billion Qualtrics acquistion is poised to create dividends in the latter‘s dual headquarter cities of Seattle and Provo, Utah. Amazon and Google are reportedly planning large expansions in New York City. That’s bad news for Midwestern cities looking to grow their tech communities. Can Utah’s booming startup programs breed another Qualtrics?